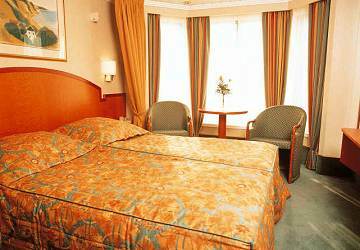 Silja Europa is the biggest and most beautiful cruise ferries on the Baltic Sea and has an endless list of amenities on offer. Amongst other things you’ll find great food, a relaxing atmosphere, tax-free shopping and great entertainment. There are more than 1000 cabins onboard ranging from luxury executive suites to standard inside cabins. 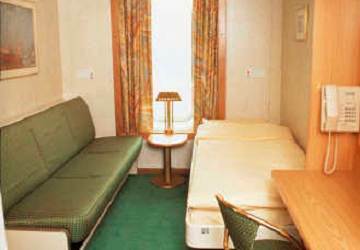 All cabins on the Silja Europa are en-suite, air-conditioned and equipped with wardrobe space, floor heating in the bathroom, radio, telephone for internal calls. 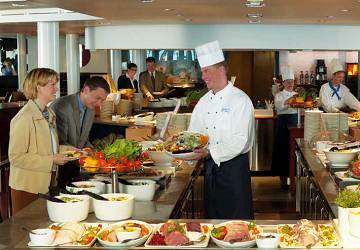 Silja Europa’s restaurants offer something for everyone. The A la Carte menus follow the turn of the seasons, and each dish is prepared, individually and spectacularly, for you to enjoy. 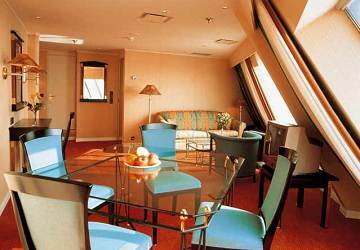 Silja Europa’s Buffet Restaurant offers both traditional and trendier delicacies. The fabulous view of the archipelago gives a crowning touch to the experience. 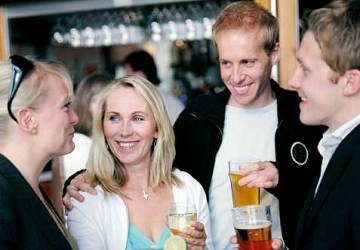 The ship's pub is the perfect start to your trip with a troubadour, karaoke and wide selection of beer. For later evening drinking and dancing head to the Ocean club and the Moonlight disco. If you fancy a bit of shopping onboard then you’ll not be disappointed with the Silja Europa selection. There’s an impressive choice available to tempt both men and women with world-famous brands on offer at low tax-free prices including the latest fragrances, skin care products, designer clothes and much more too. 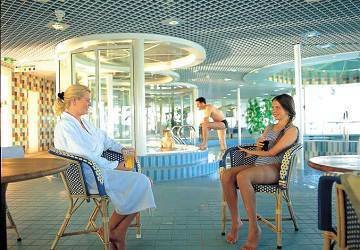 Onboard the Silja Europa you can pump iron in the Technogym equipped fitness area or chill out in the sauna, spa, whirlpool bath, get a high-quality massage, visit the hairdresser or head to the beauty salon. 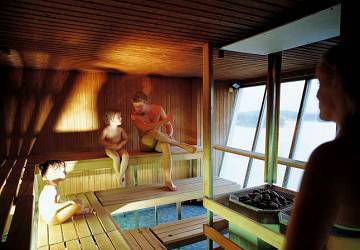 Silja Land offers activities and fun for toddlers and older children to keep them entertained for the entire journey with special events planned during school holidays and other holiday seasons. Please Note: Whilst we have taken great care in making our Silja Europa guide as accurate as possible, onboard facilities, services and entertainment may vary depending on the date and time of year that you travel, facilities mentioned may change without notification and ferry companies reserve the right to operate vessels other than those mentioned at time of booking without prior notification. Good ferry and perfect travel.The return was more longer than 3,5 hours but the ferry was better than the other one . Very good buffet on the way back to Tallinn. Excellent food with lots of vegetarian options. Both boats were in very good condition and both were punctual. 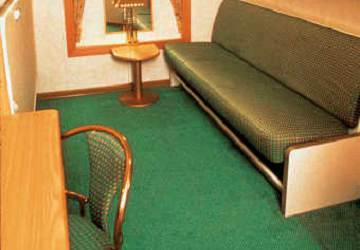 There are places on board where you can eat at affordable prices. "Tallinn to Helsinki and return "
Really enjoyed the trip starting with nice clean ports at both sides .both Ferries were really good on time and staff were friendly. Return ship had on board entertainment to pass the longer crossing. A nice way to travel from Tallinn to Helsinki and back. 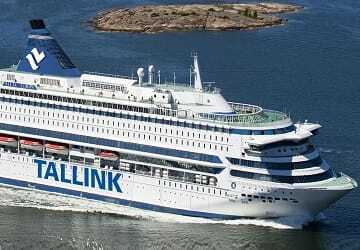 I had the opportunity to travel between Helsinki and Tallin with Tallink Silja. The ferry is gorgeous and everything is done to make the crossing pleasant: numerous restaurants, a bar with musicians, some boutiques and even a supermarket. We spent a lot of time on the upper deck. The sun was shining and it was very nice. The staff is nice and professional. We don't use the ferry very ofter, but it all went well. The only drawback is that the ferry terminal in Helsinki is bit far away from the city centre. All went reasonaby smoothly. Sat waiting for boarding in the well-equipped Tallinn terminal, I detected the delightful sound of Doris Day singing Que Sera, Sera over the harbour audio, I knew then there was hope for the world - somebody over there has a good ear for music. All was perfect nice staff, excellent trip. "Satisfied with the company "
Everything was done according to plan. The paperwork was quick and easy. Everything was perfect. I recommend the company. "Enjoyable journey from the Baltics to Scandinavia"
Great way to travel from Tallinn to Helsinki avoiding the time and effort of going to an airport. I was travelling with both my daughters and I was very satisfied about the services on the ferry. Especially we enjoy the trip with tallink star, because this ferry was big and impressive- it was like another excursion for me and my children. I would like to thank you all the staff for our nice trip and for excellent food on the ship. The ferry ride was very good, clearance at check in was smooth and the staff were very friendly, all in all I was extremely pleased, would use the ferry service at any time. The check in progress was swift, the trip was very quiet and the range of food and drink was very good. The equipment of the ferry was also very good. The ship sailed on time. It was easy to board and was very clean. A good trip, there should have been more info of where the ship sailed from beforehand though. "Will go again with this ferry." A good trip with a good company. Clean ship and best services ! I travelled on Thursday March 21 from Tallinn to Helsinki and back. It was very easy and comfortable.